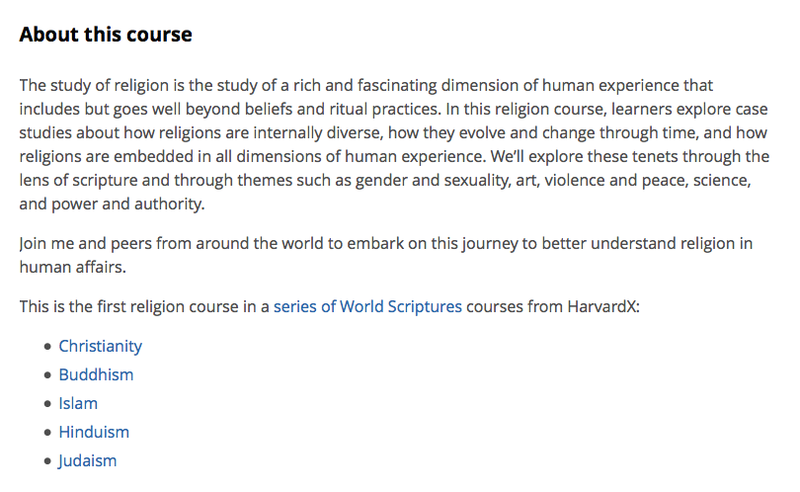 There’s little new here, of course, at least to the student of religious studies, but reaching a wider audience is obviously part of the goal driving the course (a goal our own Department shares, by the way). And that reach is, I’d argue, facilitated by the language of tradition and experience sprinkled throughout — language indebted to Wilfred Cantwell Smith, of course (who played an instrumental role in the study of religion to Harvard, in fact). There’s an irony to such approaches, for inasmuch as religion is said to be rooted in this transcendental thing called human experience — or what Cantwell Smith preferred to call faith — it is universal and timeless yet the motive of the course seems to be to argue that religion is also historical and therefore varied (consider its lesson that we can’t generalize and say such simplistic things as “Jews believe…” or “Hindus believe…”). Watch the clip above again, and listen for that word “tradition” — a favorite of Cantwell Smith’s, to name the outward expression of the prior private sentiment that, or so he and others argue, drives it all — and you may start to hear the contradiction: religions are not uniform because this thing called a experience is “embedded” (the course’s word) in different ways or, conversely, these things called religious traditions can be interpreted in varied ways. So religion is and isn’t uniform, it is and also isn’t historical. Correction: religions, in the plural, are not uniform but religion, in the singular, is presumed to be one. And there’s the moment where you see a rather familiar model that posits the existence of some extra-cultural item that is put into practice in some cultural or historical context (another key word that makes this approach work). It’s a useful model to use for this course’s purposes since it is little different from the old versions of essentialism that so many of us think we’ve overcome today yet which, I’d wager, is still part of a commonsense model that we all likely walk around with. I’m just me but that me changes in different contexts. It’s a cake and eat it too moment — we seem to be tipping our hat to taking historical contingency and thus change seriously yet we don’t let go of the notion that there’s something outside or before history (generally assuming it’s locked deep inside each of us), something “expressed” here or there, in this or that way. Come to think of it, it’s that old 19th century model of comparativism, no? Study observable differences in order to infer the universal essence (in this case, something they’re calling human experience). So what they give with one hand (i.e., attention to difference), is quickly taken away. Now if this was not the model assumed in such studies, then why not just reduce religion to culture and be done with it? After all, as the video itself says toward the end, “religion and culture are inseparable.” But that’s not what they’re saying; again, if you listen closely you’ll realize that this inextricable weaving (another key claim in the video above — only separable things can be woven together) only happens at the level of expression, representation, symbol, etc., since that is the “context” in which some prior, unseen thing makes its appearance — in the case of this course, it seems that it’s the meaning of the the text, the scripture, that is then interpreted in various ways. Aside: one wonders into what detail the course goes concerning the topic of canon formation and contestation, in order to suggest that “scripture” is no less a problematic term. For it’s not just that some uniform thing called a scripture is interpreted differently, in different contexts, but, rather, that different things count as formative texts at different times and for different groups…. For it’s precisely this notion of text and context that needs some attention, for I don’t think that it accurately describes how we read (whether a book or someone’s mood from studying their stance). For without the context (a reader trained in a certain language, for example), there is no text but, instead, there’s just, I don’t know, paper — that is, what if we entertain, instead, that context produces text, making the seeming separability of these two words (and thus the impression that they name different things) rather illusory, for they are the same thing. After all, thinking back to the opening picture, above: without his glasses, there are no books to be read — they’re now just a figment of a reader’s imagination — and he might as well just burn it all as firewood to stay warm. 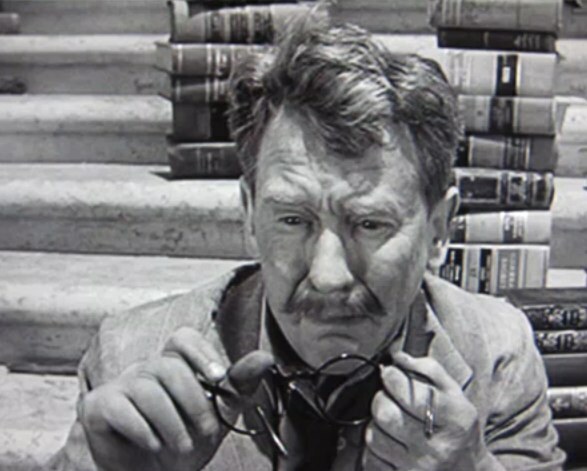 Oh, you don’t know that classic Twilight Zone episode, about this fellow, Henry Bemis, a bank teller with a love for reading who happens to survive the end of the world…? This entry was posted in Faculty Blog, Relevance of Humanities, Religion in Culture and tagged Context, Essence, Expression, Faith, HarvardX, human experience, Meaning, Text, Tradition, Twilight Zone, Wilfred Cantwell Smith, World Religions by Russell McCutcheon. Bookmark the permalink.